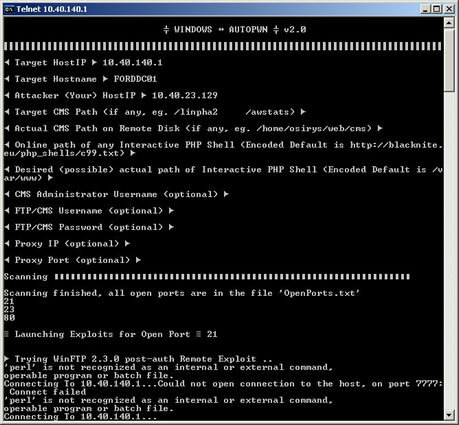 winAUTOPWN is an auto (hacking) shell gaining tool. It can also be used to test IDS, IPS and other monitoring sensors/softwares. Autohack your targets with least possible interaction. Contains already custom-compiled executables of famous and effective exploits alongwith a few original exploits. Also not forgetting that winAUTOPWN unlike other frameworks maintains the original exploit writer’s source code intact just as it was and uses it. This way the exploit writer’s credit and originality is maintained. The source is modified only when required to enable a missing feature or to remove hard-coded limitations. Under these circumstances also, the exploit writer’s credits remain intact. Some anti-viruses might falsely detect the exploits as malicious. A separate DragonflyBSD-server is being set up which will hold the exploit repository and the next version will autosync the exploits from them in the appropriate folder. In case of emergency, Press "Q" / "q" anytime to EXIT the program. Thanks to Azim "quakerdoomer" Poonawala - Project Leader - for sharing this tool with us.